Family: Sister Sarah English Schools’ bronze medallist in the hammer in 2002. Came through the Kent scene at the same time as Charlotte Dale and has long been regarded as one of the best young talents in Britain. Her first major title came over 800m when she secured the AAA U15 title, going on to add the U17 gold medal. Lisa won the English Schools' Inter Girls' 800m in 2:10.60. 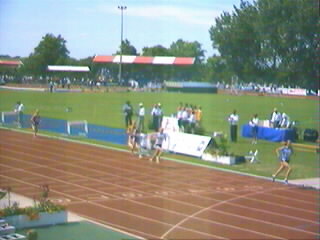 English Schools Track and Field Championships 1999, 800m FINAL. 1sr Time: 2:10.60. Made her junior international debut in 2000. She collected the English Schools' Inter girls' 800m silver medal behind Somerset's Jemma Simpson in a time of 2:10.0. 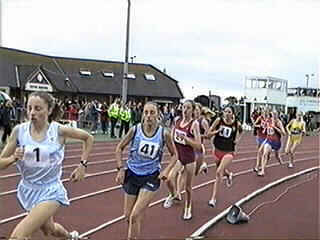 English Schools Track and Field Championships 2000, 800m FINAL. 2nd Time: 2:10.0. Lisa was the English Schools Senior Girls' 1500m champion, winning over Essex's Faye Fullerton in 4:25.85. 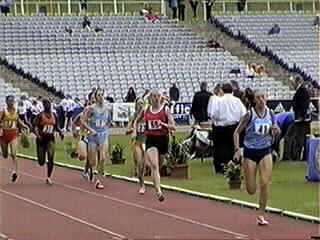 English Schools Track and Field Championships 2001, 1500m FINAL. 1st Time: 4:25.85. Dobriskey has also shown good form on the roads and cross country, representing Britain’s junior team at both world and European Cross Country Championships. Her 12th place in the Europeans in 2002 helped Britain to team gold. The first athletes to test the course were the Junior Women in their 6km race. "I'm quite pleased with my run and enjoyed the race. It was tough and ideally I would have liked to have been in the top 50. I was nervous before the European Cross Country Championships in Thun but I think this time I coped better with my nerves. I could see the other GB Team runners but Freya [Murray] and I helped each other during the hard finishing straight. However, I still prefer the track." The Norwich Union GB Team finished in eighth place with 130 points, just two points behind France in seventh on 128 points. Based at Loughborough University, Dobriskey won the 800m at the 2003 BUSA Championships and then showed good form in two under-23 competitions. She secured the AAA U23 title and went on to clock a PB of 4:12.95 for bronze in the European U23s. Running: Last year’s three medallists face a re-match: Kate Reed (Bristol and West AC) is hopefully over a foot injury sufficiently to put up a fitting defence of her title; last year’s Silver medallist Lisa Dobriskey (Ashford AC) proved her form by winning the British Students Indoors 3000m in 9:08 last weekend; Bronze medallist Freya Murray (Edinburgh) is a former European Junior medallist for Norwich Union GB. Among the other contenders, Hattie Dean (Radley AC) is in the form of her life having won the British Students’ Cross Country title and the National Silver medal; former Inter-Counties Under 20 Silver medallist Aine Hoban (Wakefield Harriers) is a student at Nottingham University and ideally placed to have done her homework on Wollaton Park’s vagaries; Laura Kenny (Royal Sutton Coldfield) won the English National Junior title a fortnight ago; Getenesh Tamirat (Belgrave Harriers) was seventh in the European Trials over 5km at the Reebok London Challenge in November and is stronger over shorter distances; and Katrina Wootton (Bedford and County AC) won Inter-Counties medals at every age group as a teenager – Gold as an Under 13 in 1999, Gold as an Under 15 in 2000, Silver as an Under 17 in 2002 and Silver as an Under 20 in 2004. Lisa was 2nd in the Senior woman's 4km at the Reebok Inter-counties in Nottingham. The Thales Fanny Blankers-Koen Games, an IAAF Grand Prix I meeting, at Hengelo in the Netherlands on Monday evening, 31 May: European Under 23 Bronze medallist Lisa Dobriskey (Ashford AC) lowered her 1500m lifetime best to 4:08.82 for sixth place, only 0.62sec and two places behind Commonwealth Games Bronze medallist Helen Clitheroe (Preston Harriers). Both will now be eyeing the Olympic ‘A’ standard of 4:05.80, which was achieved in this race by only the winner, Carmen Douma (Canada), who lowered her PB to 4:04.85. At the IAAF Golden League meeting in Zurich, Switzerland at last summer’s European Under 23 Championships medallist Lisa Dobriskey gained invaluable experience in the Under 23 Women’s 800m , which was won in 2:00.57 by Janeth Jepkosgei (Kenya). and Dobriskey, the European Under 23 1500m Bronze medallist, seventh in a personal best of 2:02.90. 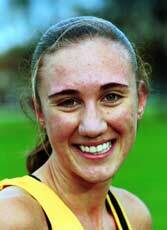 To say Lisa Dobriskey won the 2002 Junior Great North Mile at a canter would be an understatement, but the Kent speedster is fully aware of the enormity of her task against senior opposition as she returns to the scene of her breathtaking victory this weekend. The Loughborough student has made encouraging strides in the past two years, claiming a European U23 1500m silver medal in 2003 at just 19 years of age. Possibly more eye-catching, however, was the way she ran out Helen Clitheroe at the Olympic trials in Manchester last July to claim AAA silver medal behind World Championships bronze medallist Hayley Tullett. Dobriskey will once again lock horns with Tullett and Clitheroe on Saturday but everyone in the field is aware that one name really does light up the start list, double Olympic champion Kelly Holmes. The George Gandy-coached athlete came agonisingly close to joining Holmes in the 1500m in Athens but fell just short of the qualifying time. She did, however, make the journey to the Greek capital to support her boyfriend, British 800m number one Ricky Soos, and was in the stadium when Homes won her second gold medal, an experience that inspired the 20-year-old. Asked about her chances against Holmes on Saturday, the English Literature undergraduate said: “Kelly is on a different planet at the moment and will be eager to finish her season with a big win on home soil. I took a break after running in Zurich and am now back in training but in is generally base work so I am not sure how I will perform this weekend. I really enjoyed the course and the whole experience two years ago so it is great to be back. Regardless of her performance this weekend, it seems Dobriskey has the right credentials to follow in the footsteps of fellow Kent athlete Holmes. 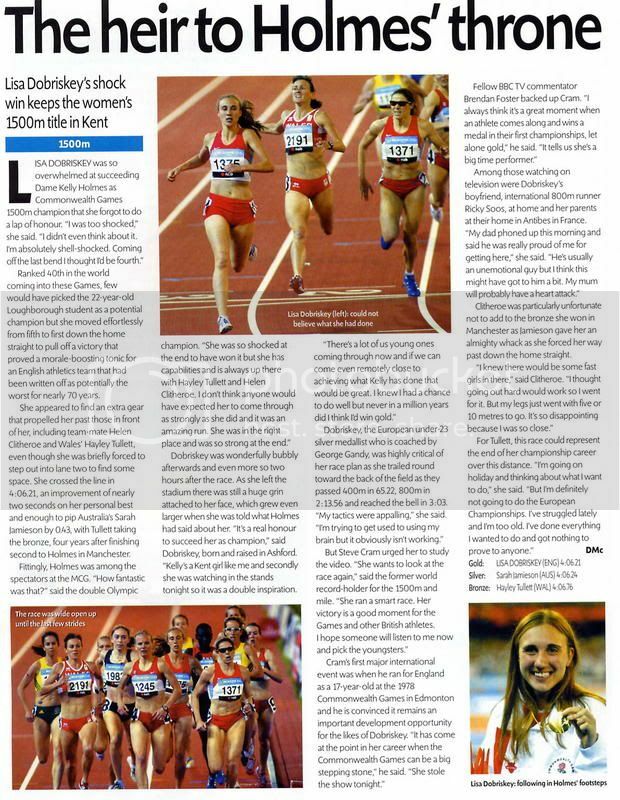 Her manager, Jonny Wootton, is confident of this, saying: “I honestly believe Lisa can the number one 1500m runner in Britain within three years. Kelly Holmes, Hayley Tullett and Helen Clitheroe are all in there thirties and at the moment Lisa has a strong lead in the chasing pack. “There are never any certainties in athletics but with luck on her side I can see her being a future world class athlete. She has a great set up in Loughborough and a vastly experienced coach who knows how to get the best of her. 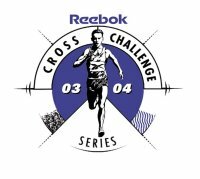 Pre-race - Lisa Dobriskey (Ashford) is expected to race over 3000m, where the women’s field includes UK steeplechase record-holder Tina Brown (Coventry Godiva). Taking the lead from the gun, Lisa Dobriskey (Ashford) burnt off the opposition including Natalie Harvey (South London Harriers) until just herself and Tina Brown (Coventry Godiva) remained in contention going into the last 1000m. The 1500m specialist pushed the pace on but with Brown set to stride out over the 3000m steeplechase in Melbourne it wasn’t until the final 100m that the shorter distance speed won through in 9.10.44 - Brown snatching an encouraging PB in 9.11.08. The star performer, however, was 17-year-old Non Stanford (Swansea) who ploughed her way around the EIS track, catching Harvey and running alongside all the way to a Welsh Junior record of 9.22.98. Lisa Dobriskey (Ashford) started the 1500m knowing full well that the bumping and barging of the previous evening had seen room-mate Becky Lyne tumble out of contention. However, she was still unable to free herself from the field when a break occurred with 300m to go, and she suffered badly, fading to seventh in 4.18.13.